Stan Hasselgard must have had an incredible talent for socializing, or building networks as we say today. 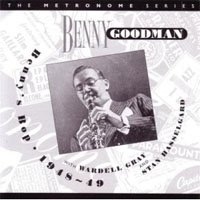 He introduced Wardell Gray and Chico O'Farrell to Benny Goodman. Gray joined the septet, O'Farrell would later write arrangements for Goodman. "The brilliant Swedish clarinetist Stan Hasselgard rescued him from anonymity by introducing him to Benny Goodman. He helped launch the career of one of the great composers/arrangers in jazz history" (Harvey Pekar, Latin Beat Magazine). Back in New York in the summer of 1948 he encountered his friend from California, the skilled trumpet player Uan Rasey, and asked him to devote time to Fats Navarro! Rasey taught Fats breathing and double tonguing during two and a half weeks. The lessons sometimes took place in Benny Goodman's appartement, where Hasselgard stayed at the time. "Yes, Stan was a good friend. He was a very fine clarinet player and a real nice guy. Stan and I played together in California along with Dodo Marmarosa and many other fine musicians. Dodo was a fine player who understood the modern harmonies, and unlike a lot of the early bop pianist, he had the technique to keep up with Bird and the other boppers. Earlier that year, he had an engagement with Goodman’s group, which included Wardell Gray and Teddy Wilson, at the Clique in Philadelphia. Stan told me that one evening Goodman was late, so Stan started off with the group playing Benny’s part. When Goodman arrived, he was angry that Stan had started without him, and would not permit Stan to solo for the rest of the engagement! Stan took it in stride." Hasselgard never missed an opportunity to hear and meet his idol Benny Goodman. In the fall of 1947, Red Norvo brought him to a Goodman rehearsal for a recording session and after that, Hasselgard would be able to visit the Capitol studios for both rehearsals and recording sessions. He was soon to walk into the studio as a band leader himself. "During the spring of 1948, Goodman repeatedly invited Hasselgard to his home in Pacific Pallisades outside of Los Angeles. They began to play together informally, and Benny soon got the idea to add a rhythm section. In April, they made a couple of concert appearances on the West Coast. "Big plans were made for a Carnegie Hall concert in May, and they both flew to New York. Various musicians were tried, including a reluctant Teddy Wilson, but eventually Goodman had to cancel the concert. At this time, he could not draw an audience big enough, not like his triumphant concert ten years ago. Instead, Goodman secured a gig in a restaurant in Philadelphia, the Click, where the band played short dinner shows during two weeks, starting at seven o'clock in the evening. The Dragon CD omits, from the several recorded broadcasts, Goodman's solo numbers and a number of Patti Page vocals (and one by Frances Wayne). Yet, there is very litte solo space for Hasselgard on the 20 tracks. The highlights are Stan's solo on his old favorite All the Things You Are and on one of the versions of Mel's Idea. Wardell Gray is featured on Indiana/Donna Lee. "The job with Goodman in Philadelphia was nice, despite many exhausting broadcasts that you'll never get paid for. When BG is inspired, he can really play and that happend often. I hade to hide, filled with sudden complexes, behind my music stand. Teddy Wilson is excellent as usual but Wardell Gray takes the prize –absolutely the finest tenor player in the States. The bass player Arnold Fishkind was sacked the first night (and you're lucky as long you can stay aboard) and was replaced by Clyde Lombardi. We'll start in White Plains on the 18th and I think Benny has a radio show planned. Benny wants Svend Asmussen to come over, and I hope it will work. I've advocated his case, played his records and bragged about him. I met Denzil Best the other night (he plays with Thelonious Monk at the Chicken Roost) and he talked enthusiasticly about Sweden and wants to return as soon as possibly." 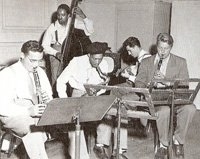 Goodman, Ray Brown, Gray, Wayne and Stan rehearsing. Socializing in Hollywood. 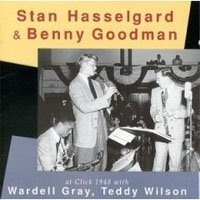 Wardell Gray and Stan Hasselgard. From the dvd-cover of Abraham Ravett's film “Forgotten Tenor,” a documentary about Wardell Gray. It can be ordered from aravett@hampshire.edu. Shorty Rodgers watches Goodman, Fishkind, Stan, Gray, Zelnick and Billy Bauer rehearse. The Dragon CD with the Click recordings. It looks that this HEP CD offers more tracks with Goodman and Hasselgard together, but no. Goodman and Gray are featured in a quintet setting. Two Hasselgard tracks come from his own November 1948 broadcast with Barbara Carroll and Chuck Wayne.